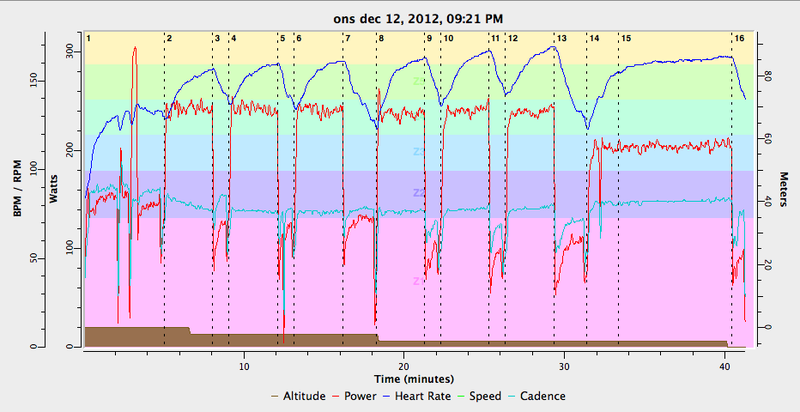 7% vs 29% @ VO2 Max. Without the PM I would have no idea how long I was at VO2 max for. Today’s set was short and very difficult – I re-tasted my dinner after the fourth one minute interval. It looked a little like this. I did an early morning swim today. I had planned to back it up with a Turbo session but time was not on my side in the afternoon and now that it’s evening, I’m too tired. Swim – Ikea – Family time – Ikea Assembly and a late dinner was the order of play today. 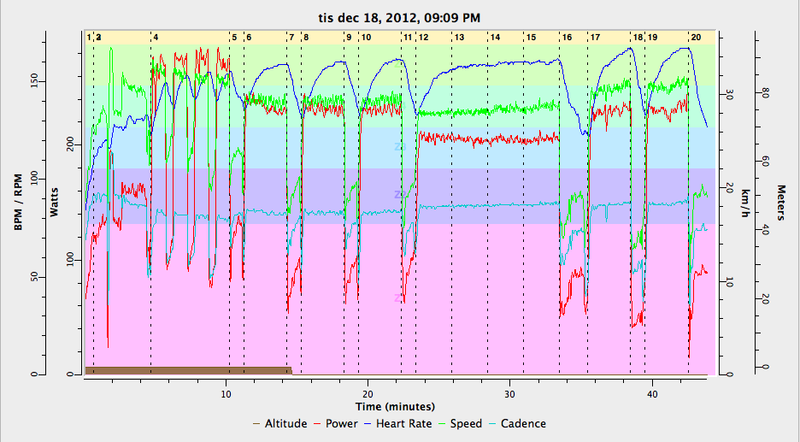 I was holding 1:33-1:34 for the 100s and 3:14 for the 200s until about the 1,9km point. It got pretty difficult after that point. Not surprising considering my almost complete lack of swim training since August. Today was a victory – I felt good, had a semi-respectable splits and enjoying the swimming. Onwards and upwards. Hit the spot, but I won’t know until tomorrow how difficult it was… there was never a question of not finessing so, perhaps the intensity was a little too easy. Maybe 330-340W is the target for newt time. 100-500 up and down pyramid. 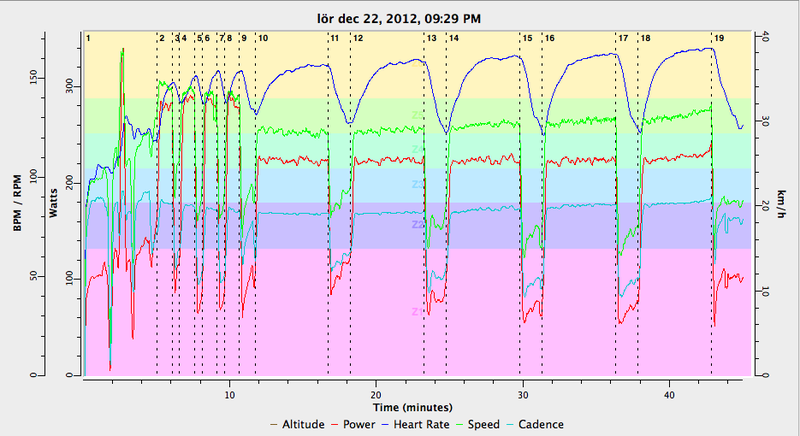 I’m begining to feel good on teh bike; I feel I can put a pretty dificult session together now… Six months to my A-Race. Since my last entry I have done a 2 hour spinning set and a short slow run. Feeling good and ready to do some damage on the trainer tonight. If I get the time I’ll try a tough 2×20 minute set. 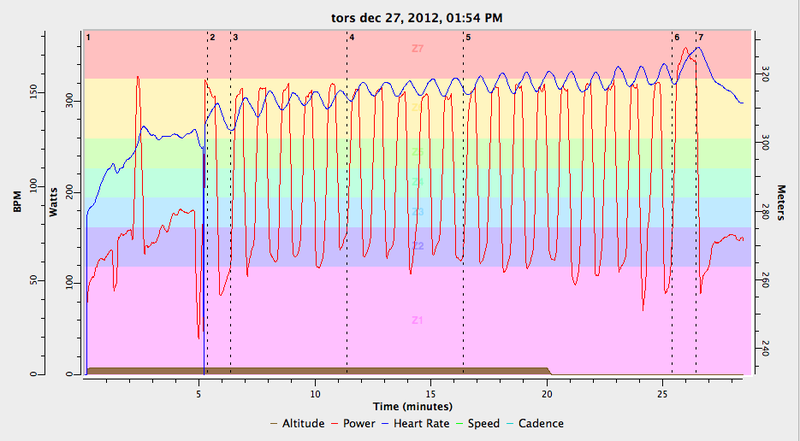 I swam today and backed it up with some time in the pain cave – aka the shed. My swim was an easy affair of 9×4:00 on 0:15 rest. Easier than yesterday. I’ll try top do another one tomorrow. Third session back on the bike and I’m starting to feel like I will soon be able to do a good set. Tonight was a downward progression in power. I had thought I’d be able to hold 7 x [3:00 @ 240W on 1:00 rest]. 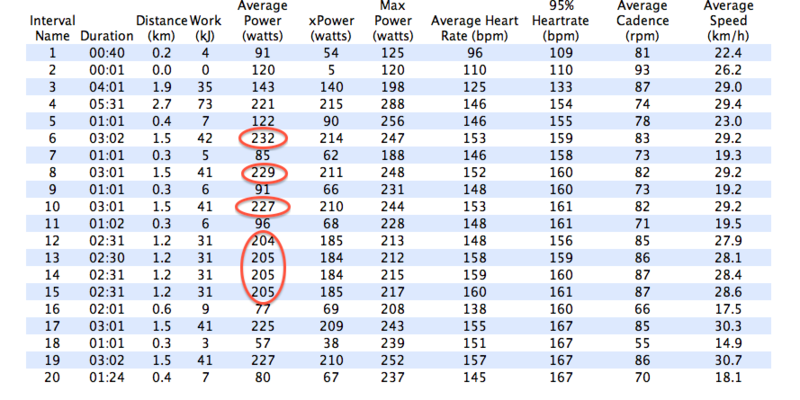 Looking back at last week’s set I now see that I was only doing 220W for 2:00 – today’s was slightly more challenging. See the downward progression below, followed by the graph. 154,000 or a Fast 51,500? That is the question that is weithing on my mind today after I failed to get a place in Vansbro Triathlon. The other Half Ironman distance races in Sweden are a little too late in teh year for my liking. This leaves Vättern Long Distance Triathlon or one of many Olympic distance triathlons. Goals would be a Sub-7 Long distance (4000m/120km/30km) or a sub 2:05 Olympic distance. I’ll have to assess what I can really do in training in order to decide what is best. I just might hit the trainer tonight… perhaps. Saturday: First time running in 5 weeks – I felt pretty good until the 25 minutes mark, then it was a pretty difficult 20 minutes home. Today is about starting the week off again – a little bit more challenging than last wek.